Sarah Edgar, Heidi Estevez, Aesha Shapiro, and Allison Walkey had been cited on June 5th for violating the San Diego City law against having fires in Ocean Beach Park – near Dog Beach. They were all members of a troupe of fire performers called Hoop Unit, managed by Valentina “Unity” Martin, and were practicing at night with their lit hoops. San Diego Muni Code 63.0102(B)(11): Fires. It is unlawful to kindle or allow to be kindled any fire or bonfire, or throw upon the ground a lighted match, lighted cigar or cigarette, or anything that would be liable to set fire to any grass, tree, shrub, building or other property;. The young women – all in the twenties and early thirties – wanted to fight it. If found guilty on an infraction, there was no custody or probation of course – we’re talking traffic ticket level – but there were hefty fines – and any subsequent prohibition on their ability to practice their craft at the beach. Valentina Martin and most of the girls have been involved in a larger grouping of performers that have coalesced around the issues that their case has raised. They were cited in early June. By late July a coalition had formed. Called the San Diego Fire Coalition, it’s now attempting to work out agreements with the City and Fire Marshall – something that has occurred up in the Los Angeles area -, and at the same time arranging places to practice on private property, as well as other tasks. It is hoped that the group can hammer out something with the authorities so future fire hoopers won’t be cited or worse – arrested -. This win in court today will be celebrated by this community of performers, and it should boost the Coalition’s efforts in the long run, and at the same time, it may take the edge off their campaign in the short run. In court today before Commissioner Doft, the performers’ counsel had Valentina show and explain the hoops – two of which had been brought to court – and she actually put on a brief performance, demonstrating how she twirls and moves the hoops – a wonderful scene in what is usually a very, dull traffic court. Martin also explained to the court the performances that she and the group will be doing, how they practice, and especially all the safety measures they take whenever they are practicing. This was key to their defense. The women were not doing anything illegal because of all the safety measures taken that night – which is the usual. There were two people, called “safeties” standing by with a fire-retardant blanket, treated with a chemical called duvetayne – the same chemical used to treat theater curtains. The performers wore only cotton clothing as synthetics burn and light on fire more easily. The fuel can had an air-tight lid and is kept at a distance from the fire. They also tape the hoops – and most of all – they train – for months, before they ever perform. During practice, these performers have never dropped their lit hoops. Another key thing that led to the court’s ruling was that other police officers have allowed the twirlers to practice at the exact same spot that they were cited. Martin explained how fire performers have been practicing in OB for years, and that police have requested that performers do their thing at the beach. This statement by the officers’ superior could not come into court, of course, as it was hearsay. Finally, it was time for a closing argument. Their counsel argued that the law was confusing, to the performers, and even to the citing officers, that the only restricted act according to the statute is lighting a fire that “would be liable to set fire to any grass, tree, shrub, building or other property.” And this didn’t happen, according to the evidence. He argued that their conduct did not fit the statute and the statute did not fit their conduct. He said that this is something that needs to be worked out between the City of San Diego, the Fire Marshall and the fire performers’ coalition. Copies of an on-line petition in support of the hoopers were also presented to the court. Begun here on this blog, 290 signatories had expressed their support. Commissioner Doft then ruled. Relying on photos supplied by Officer Lockwood, he offered that there was only dry grass and dirt where they were practicing. He said that this is conduct that some officers think is okay, but other officers don’t think it’s okay. “It’s up to the City Council,” he said, to pass legislation covering this type of activity. “This is not prohibited conduct.” These people, he said, can never be cited for this again at that location. He then declared them all not guilty and the case dismissed. Outside the courtroom, everyone was ecstatic and overjoyed. The girls were totally relieved – they can go on with their profession, their hobby, their craft, and for some their livelihood. “Does that mean we can go back to the very same place and practice?” someone asked. “Yeeess!” was the resounding response from everyone else. This is a great finale to this chapter of the fire performers’ community. These performers and dancers will be back to OB and on the beach twirling their hoops. Hey, how do I know all this? I was their lawyer. A victory for the human spirit and joy and expression! This eclipses all of the not so good news today with something exuberant and deeply satisfying. 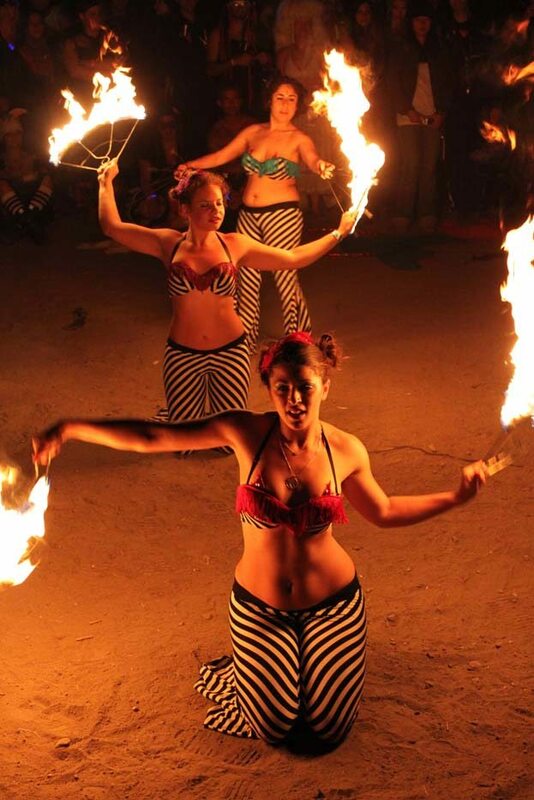 A big thanks to the Fire Hoopers who in their own unique way remind us that “Fire is Good!” and to Mary Mann for bringing these women and their art to our attention. And Frank- thanks for not only writing about the Fire Hoopers, but defending them. Defending them successfully. Yessssssssssssssssssssssssss! Thanks Frank for proving common sense can sometimes win. Local state and federal government is making it harder every day. okay, i take back my last three lawyer jokes…. whoops, wrong blog. Congrats to all of you! It feels good to be vindicated, huh? Thanks everyone – does feel good to win. And thanks to you BillRay for starting that online petition many moons ago. (For some reason the site where it was would not let me print out the entire petition, but I did print out the text and the number of folks who signed on.) I presented what I could to the judge. Frank you just made my day. Thanks! Right on. Congratulations ladies. Nice work Frank G.
Jon, thanks. The hoopers were all jazzed. There has been a lot of support for them during this period from their own performance community as well as from OB. Good Goin’ and nice work. Always nice to get some GOOD news! Thank you Frank! Thank you everyone who signed the petition, donated money or just generally supported our cause. All of you are appreciated. I am so relieved! Unity- are you going to Hoop It Up at the beach soon? Please let us know when and where. I would love to see this, any idea when they will spin fire again ?? When will the group be at the OB practice location ? This is the outcome I’ve been hoping for. I’m guessing that the spinners have breathed a sigh of relief and can now get back to doing what they enjoy. Along with the sigh of relief comes a whole bunch of publicity that they never bargained for. Up until this incident I had never heard of the spinners and now I’m really looking forward to watching one of their sessions. Frank, you have a heart the size of Texas. You took on this case without being asked and I’m pretty sure you did it pro bono. Thank you. This community is a better place because of your efforts. PS: I’ll bet the judge had a great time bragging to the other judges after work. ms unity – you’re the leader of the troupe. i think many of us in OB would love to see a demonstration here in OB, so, any chance you all could put on something and simply leave out a donation hat? a lot of us here in OB support you guys but (… can’t make it to PB for $10). Excellent news…congrats Frank and keep us posted on practice sessions in OB!